It seems like the year just got started and the ARRL June VHF contest happened. I wasn’t well prepared, on account of one of the busiest and most difficult years at work I’ve ever had. That, and I have been doing a lot of hiking and SOTA activations in my spare time. In any case, it was Friday before the contest, and I was finishing up a report for work that took me past 3pm. I would have to scramble to get the truck together by midnight. And scramble I did. I got almost everything together and tested out the radios, only to find some problems. The 6m TE Systems amplifier was malfunctioning. The SWR was high on the rear 2m and 222 MHz antennas. These things would have to await the morning light. My impressions from reflector discussions is that there are two philosophies on building a limited rover station: (1) Use the minimum number of rigs and other equipment to cover the needed bands, and (2) Have one radio for each band. I definitely fall into category two. I want a dedicated radio for each band, and with a limited rover that means (ideally) 8 radios. Why eight? Because there is some advantage to dividing the world into “weak signal modes” and “FM modes”. Still, I manage to reduce the number of microphones from 8 down to 5. 6m + 223 MHz FM: TYT9800plus, with 223 MHz into Mirage 100w brick. So…five radios and five bricks (if you count the dead one). For 222 MHz, a cross-over switch switched the transverter/TE Systems amp and FM rig/Mirage amp between the front and rear antennas. Mag-mount whips were used with the 6m, 2m, and 440 MHz FM rigs. My planned route was pretty close to what I did last year. This map shows the general locations. Saturday begain in Ocean Shores, WA near the CN76/CN77 line, and working my way to the CN85/CN95 line on the Columbia river near N. Bonneville, WA, and then to a motel in Centralia, WA for the night. Sunday’s route went from Centralia to Mowich Lake Road near Carbonado, which permits me to hit CN87 at 2,160′, CN86 at 3,000′ and CN96 at 3,100′. I stopped in Central Park, Issaquah to activate both CN97 and CN87, and then off to CN88 at a school parking lot (400′) in Lake Stevens, and finishing with a trip up Mt. Pilchuck to about 3,000′. I woke up early on Saturday morning to fix a few last minute issues. But I was slow, groggy and didn’t leave the house until about 8:00. As a result, I arrived in Ocean Shores just as the contest was starting. And just as a parade started down the main street of town. Fortunately I was able to circumnavigate the parade and make my way to a gas station to fill up the truck for the long day ahead. As a result, I was about 15 minutes late getting started in CN76. I had a lot of difficulty making QSOs until I realized that the coax was switched between 2m and 222 MHz in the rear antenna stack. Down came the antennas to verify the hypothesis and correct the problem, and right back up they went. One of the advantages of having front and rear antennas is that I can tell when something has gone wrong with the rear antennas, if I find the front antenna outperforms the rear antenna for the same band. Six meters was noisy and not very productive, with little evidence of sporadic E (Es) propagation. At the appointed time, I moved a mile down the road into CN77. Things worked a little better, and I even worked WA7JTM in DN53. Alas the Es opening was fleeting. It was the one and only Es QSO of the day. I made a brief return to CN76 before embarking on a long trek to a CN86 stop just below the Green Mountain summit near Kalama, WA. The QSO rate was quite low during this 1.5 hour trip. the real fun began at the stop, where all four bands came alive. I managed to work VE7AFZ in the extremely rare CO80. At some point I heard NA7Q mention that he was on Nicolai Mountain, which is a SOTA summit I had activated a week earlier. I asked him to step out of his car and try to work me with a hand-held radio. That worked, so not only was it a contest QSO, but a SOTA “chase” for me. After that, I headed to the other side of Green Mountain to the property of a friend that sits on the high-point of Green Mountain Rd. Again, the bands came alive with the exception of no Es. I worked VE7AFZ again on 6M as well as KE7MSU/R in CN76 on 6M and 2M. At the appointed time, I left this wonderful location to head to the CN85/CN95 line outside of N. Bonneville, WA. This location is usually surprisingly productive, almost exclusively with Portland area QSOs. But this time, my buddy Etienne, K7ATN/R, was planning on being across the Columbia River in Oregon for us to do a little grid dance. Besides working K7ATN/R on four bands in four grid combinations, I was able to work KI7M in CN84 on 6M and K7EW on 6M, 2M and 222 MHz from CN95. I left the area at 10pm local time for a long drive north to Centralia, where I had motel reservations. When I got there, the reservation had been canceled. They said the credit card (on file) for holding the room was rejected, which I found odd, since I had stayed in the same chain—Motel 6—including a late check-in, for the SeaPac convention just a week earlier. I guess I don’t stay in Motel 6s any more. As a result, I drove home to Redmond and hit the sack at 2am with the alarm set for 6am. Sunday morning began near Mt Rainier national park on a gravel road to one of the park’s more obscure entrances. I made 20 QSOs in CN87 and 16 more in CN86 en route for the two hours it took me to get to CN96. Nice way to start the morning! 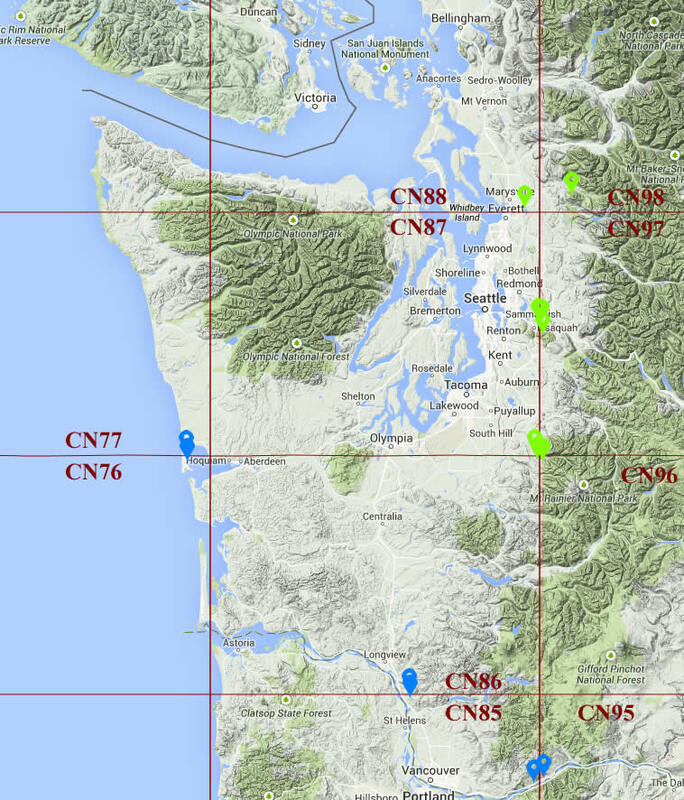 CN96 was extremely productive locally, including working VE7DAY in C070, KF7PCL in CN76 on two bands. But as Es propagation picked up, another station, some 70 miles away on a mountain top, operating up the band, produced so much splatter that it, essentially, wiped out anything weak from the CW portion of the band to 50.200. It was a little frustrating. On the CW portion of the band, a nearby CW KW station had a clean signal, but de-sensed my TS-480 (even with a 300 Hz filter kicked in). After finishing up with CN96, I briefly stopped in CN86, hoping to catch the last few stations that hadn’t worked me in my many previous hours in CN86 and hoping to catch some Es, but with no luck. I did manage to work Rod, WE7X, in CN97 on 432 Mhz for a new multiplier. At some point it occurred to me that I might escape the splattering station by positioning Squawk Mountain between me and him. That would put me in a valley, but I wasn’t going to work Es from my 3000′ location. So, I took off along a route that moves back and forth between CN87 and CN97. And it worked. I was able to work some Es in CN87 and then move into CN97 and work some more. In all I made a dozen Es QSOs before moving on to another high spot—Central Park in Issaquah. This location allows me to easily move between CN97 and CN87. The offending station went QRT shortly after I arrived, and I managed to work many local stations, and a half dozen Es QSOs on 6m (as the opening faded). Next up was CN88 in Lake Stevens, WA, about an hour to the north. The location is mediocre at 400′, but is easy and quick to access. While there, Dave, KA7RRA, stopped by to say hello. Just after 0000Z, I left CN88 and headed to Mt. Pilchuck in CN98. I work out of a location that is at 3,000′ on the side of the mountain. This location usually turns up some new grids. This time, Van, WB7UZO found me on 6M, and I picked up some new mults from VE7DAY (CO70) on 2m and VA7FC (CN79) on 6M. Compared to last year, activity in the Pacific Northwest seemed rather down for this contest, and there seemed to be fewer rovers. We did have Es, but I missed a big chunk of it, in part, because of a splattering station. The score is slightly down from the 2015 June preliminary score.